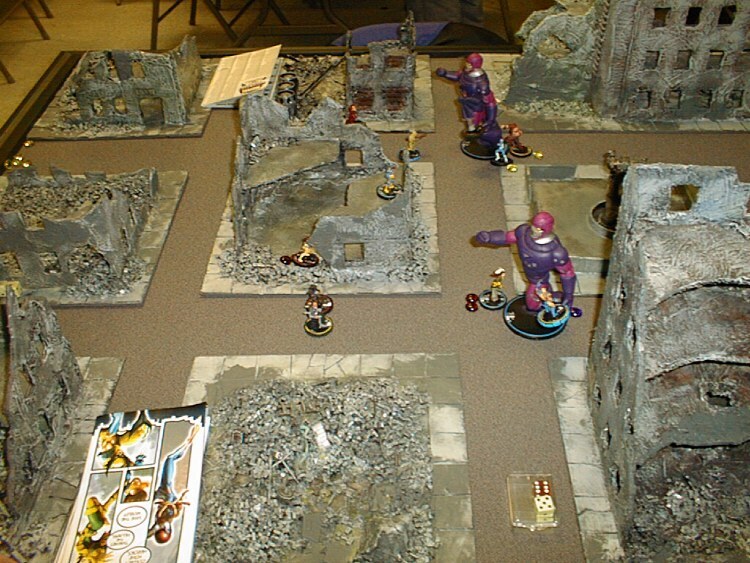  Metropolis Mayhem (200 - 300 points); Use Dirt Cheep Cityscapes by Microtactix or some cardboard boxes (cut out holes in them for windows & doors), textbooks and blocks to add the third dimension to your existing HeroClix 3' x 3' maps. Here, an equal point "theme team" of Spiderman, Superman, Batman & Robin or Daredevil can battles vs. their archenemies. Each player aims to defeat the other in 40 minutes.  Dr. Dooms Castle (300 - 500 points); Use WizKids Castle sets and point values on a 3' x 3' battlefield. Here Dr. Doom and his henchmen (Annihilus, Klaw, Puppet Master, Sprial and Ultron, etc al...) plus all of the Doombots you can muster attempt to defend their castle headquarters vs. a superior number (+50 to +100 points) of super heroes. The Dr. Doom player is trying to defend the HQ castle sections. The super hero player is intend on destroying the HQ castle sections in 60 minutes. Score victory points as per HeroClix rules, doubling the points for castle sections (still standing and destroyed).  Days of Future Past (500 - 700 points); Use a custom built 3' x 3', partially destroyed cityscape terrain with multilevel buildings (with cutaway access), along with burning debris and rubble strewn streets (ie., Marvel Comic's "Days of Future Past" set in New Your 2013). Equal points of X-Men vs. Brotherhood of Evil Mutants. (Three 200 pt. Sentinels are optional for Demo games or 3-player games.) Each mutant team is trying to get into Freedom 4 Plaza (the top floor of the center building) to download data and then destroy the main computer, the Sentinels are trying to capture them all. Score victory points per HeroClix rules, plus 25 points per the start of your turn for controlling (downloading data) the main computer and 200 points for controlling (destroying) the main computer after 80 minutes. See the images on the left of this frame.  Replace "adjacent squares" with the standard "base contact" WizKids rules. Flying; Soaring / Hovering straight up or down along a single axis to ANY abrupt elevation level for only one (1) speed point. Flying horizontally from building to building is possible, measured diagonally whenever applicable. Leap/Climb and/or Phasing; Move up or down along a single vertical axis to ONE elevation level for one (1) speed point. Leap/Climb and/or Phasing horizontally from building to building is possible, measured diagonally. Damage value of 2 or greater; Climbing up or down along a single axis to ONE elevation level for two (2) speed points when the character is in base contact with a wall or support structure. This movement is limited to TWO (2) elevation level changes per character activation. None of the Above; Any character not meeting these requirements can safely climb down (never up) along a single axis ONE elevation level for three (3) speed points per level. This movement is limited to ONE (1) elevation change per character activation.  The Line of Fire is blocked if it crosses any object (blocking terrain feature or character) that directly intervenes in the path of the LOF from the attacker to the target measured diagonally when applicable.  Use the Low Wall rules in regards to Windows & Doors.  Sentinel / Sinestro can attempt to capture a target character on the edge of abrupt elevated terrain (ie. positioned for LOF to the ground) and even behind an open window, as if the two were in base contact.  Mix and match the SACs, PACs & SEs as you like and affects have a spherical, 3-D radius when applicable (i.e. Pulse Wave). In the background; Magneto has been taken captive by a Sentinel while Juggernaut and Quicksilver try to release him. Sabertooth and the Scarlet Witch close-in to help the Brother Hood of Evil Mutants. In the foreground; Wolverine is taken captive by a second Sentinel while Rouge pushes in an attempt to save him. Wolfsbane and Professor Xavier look on while Jean Gray just telekinetically lifted Cyclops to the second floor where he will use his superpowers to help the X-Men. All in all, not a good day for the mutants.